Storm surge (maree tempete) is the change in the water level caused by the presence of a storm/cyclone. It is an abnormal rise of water generated by the storm or cyclone, over and above the predicted astronomical tide. Since storm surge is a difference between water levels, it does not have a reference level. Storm surge is caused primarily by the strong winds in a storm/cyclone. The low pressure of the storm has minimal contribution. The wind circulation around the eye of a cyclone blowing on the ocean surface produces a vertical circulation in the ocean. In deep water, there is nothing to disturb this circulation and there is very little indication of storm surge. Once the hurricane (cyclone/storm) reaches shallower waters near the coast, the vertical circulation in the ocean becomes disrupted by the ocean bottom. The water can no longer go down, so it has nowhere else to go but up and inland. In general, storm surge occurs where winds are blowing onshore. The highest surge tends to occur near the “radius of maximum winds,” or where the strongest winds of the hurricane occur. Central Pressure: Lower pressure will produce a higher surge. However, the central pressure is a minimal contributor compared to the other factors. Storm Intensity: Stronger winds will produce a higher surge. Size: A larger storm will produce higher surge because the winds in a larger storm act upon a larger area of the ocean and also tend to affect an area longer than a smaller storm. Storm Forward Speed: On the open coast, a faster storm will produce a higher surge. Further, a higher surge is produced in bays, sounds, and other enclosed bodies of water with a slower storm. Angle of Approach to Coast: A storm that moves onshore perpendicular to the coast is more likely to produce a higher storm surge than a storm that moves parallel to the coast or moves inland at an oblique angle. Shape of the Coastline: Storm surge will be higher when a storm/cyclone makes landfall on a concave coastline (curved inward) as opposed to a convex coastline (curved outward). Width and Slope of the Ocean Bottom: Higher storm surge occurs with wide, gently sloping continental shelves, while lower storm surge occurs with narrow, steeply sloping shelves. Storm tide (raz de maree) is the water level rise during a storm due to the combination of storm surge and the astronomical tide. Since storm tide is the combination of surge and tide, it does require a reference level. A Swell is an ocean wave system raised at some distance away due to winds blowing over that area and not raised by the local wind blowing at the time of observation. Swell waves travel from their source, usually out of a stormy or a fetch of windy area and continue on in the direction of the winds that originally formed them as sea waves. The swell may travel for thousands of miles before dying away. As the swell wave advances, its crest becomes flattened and rounded and its surface smooth. Swell waves are characterized by a relatively long and regular period. The amplitude of the swells at source. High amplitude swell at source is likely to be more energetic even distances far away from its source. State of Astronomical Tide: The amplitude of any swells in a particular location will be more significant during spring tide (which occurs during full moon or new moon). Phase of Astronomical Tide: The amplitude and impact any swell is further exacerbated by the tide phase (high or low tide). This is of particular importance in the lagoons, where during high tides, it can lead to significant bulge of water. 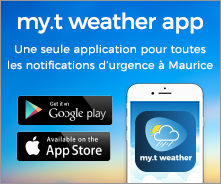 The Mauritius Meteorological Services issues warning for high waves arising from heavy swells which has originated far from our region or due to storm tide arising from a distant storm/cyclone. As far as practicable, about 12 hours in advance, a Special Communiqué is issued to inform the public of any impending high waves based on observation available. Storm surge warning is issued when a storm/cyclone is evolving close to our region. It is usually embedded in the Cyclone Warning issued.